Whatever Golden & Area A does with the concept of community collaboration, residents can take comfort in the fact that they are not the first to question "what can we do better together?" And they definitely won't be the last. Here are a few examples of how small communities are working together to plan for an inclusive and prosperous future. Revelstoke has 20 years of planning experience that has helped their community be well-positioned to address needs and take advantage of opportunities. Revelstoke has a very thorough Integrated Community Sustainability Plan (ISCP) (which is built upon their Official Community Plan (OCP)) and provides important decision-making guidance above and beyond land use planning. An ICSP provides a fresh look at the future for a community, to set priorities with a long-term strategic lens. It creates an ‘umbrella’ that integrates and links existing plans for efficient action. Similar to past Community Development Action Plans, this ICSP compiles current data and a comprehensive survey about community members' well-being and desires for the future. It also involved the community in prioritizing community-wide actions to improve sustainability. High River Town Council approved the creation of a special task force to spearhead the development and implementation of an economic action plan for the town. The Mayor's Economic Development Taskforce will include members of the community who have been appointed by council to take the strategic lead in creating an economic plan that will ensure long-term prosperity and sustainability for High River. "We have gathered a lot of information and ideas over the past few months and now we need to create a very targeted, action-based plan that clearly establishes High River's future," said Mayor Craig Snodgrass. "We can no longer take a broad approach to economic development. We need to have a laser-sharp emphasis on the industry sectors that are long standing in town and sectors that we want to attract." The taskforce includes community members who have been actively involved in renewing and growing High River's economy and were chosen for the range of abilities and energy they can contribute. They include Jodi Dawson, Mike Nychuk, Jim Ross, and Rod Cunniam. And council representatives Peter Loran and Mayor Snodgrass. "They bring the diverse skills and expertise that we need to move High River forward," said Snodgrass. "They are the type of people who can identify the best fit for our community and have the energy to get things moving quickly; that's what High River needs." The taskforce will have a very specific timeline to complete the economic action plan by fall 2015 so that it can begin to be implemented before the end of the year. The first meeting is scheduled for Friday, February 13, 2015. Valemount has gone through a series of evolutionary steps that has seen their CED function grow to include hotel tax-generated marketing activities and receive Northern Development Initiative Trust (NDIT) funding. The Village of Valemount is nestled between the Rocky Mountains, the Monashee Mountains and the Cariboo Mountains, at the foot of Canoe Mountain. It is the home of Mount Robson, the highest peak in the Canadian Rockies, and at the watershed of the Fraser and Columbia basins. This is real mountain country with natural beauty, quiet solitude, and clean mountain air. Valemount offers some amazing snowmobiling and heli-skiing in winter; hiking, camping, and trail riding in summer. Valemount is a rural community of approximately 1,065 residents on an area of 399 hectares or 4 km². Valemount is also the commercial centre for another 700 people who live in the Regional District of Fraser-Fort George, from Albreda to Small River. Today Valemount’s economy is based on logging and a rapidly growing tourism industry with more than 500 hotel rooms ready for visitors who appreciate the wide variety of outdoor adventures this Rocky Mountain destination has to offer. The Village of Valemount is served by ADSL and broadband wireless Internet access, 911 service, which includes the RCMP, a volunteer Fire Department, and BC Ambulance Service. The Valemount Community Health Centre is a full service health centre with 3 full-time doctors, support staff, lab technicians, and nurses. From all indications, Valemount is ready for a growth spurt as investing in mountain resort properties has huge potential. British Columbia real estate investments are highly sought after by Canadians, and it is growing in popularity with overseas investors in Britain and the rest of Europe. Participating in the Water Smart Ambassador Program to reduce the Village water consumption and review water metering to see if this could be a project the Village wishes to pursue. The Village of Valemount has invested over $1.9 million into the community's main commercial street in order to improve the downtown area. The Village of Valemount completed construction of a new Visitor Information and Interpretive Centre in 2007 that also houses the village's municipal offices, and markets the wide range of tourism and recreational opportunities the Valemount area has to offer visitors. "Salt Spring Island is the largest, most populous, and the most frequently visited of the Southern Gulf Islands," according to Wikipedia. The membership of the CEDC consists of the CRD Regional Director and eight appointed volunteer commissioners. Salt Spring Island Community Economic Development Strategy and Action Plan The Salt Spring Island Community Economic Development Commission (CEDC) is developing an economic development strategy for Salt Spring Island outlining comprehensive action plans in the areas of tourism, agriculture, Ganges village, enabling entrepreneurs, and community engagement. Please provide your comments on the plan via email by October 31 to be considered in the finalization of the CEDC report. Comments received after October 31 will be considered as the CEDC continues to refine and update its plans. Meetings The commission generally meets quarterly, at the Salt Spring Island Public Library, from 4 - 6pm. Agendas are posted on this website approximately 3 days in advance. Members of the public are always welcome. Residents, businesses and associations interested in speaking to the Commission about economic matters are welcome to address the Commission as a delegation. Delegations need to register with the CRD’s Salt Spring Administration office, by completing the delegation form, at least one week in advance of the meeting they wish to address. Please note that presentations are limited to five (5) minutes. Community Development Program In fulfilling its mandate of developing and implementing economic development initiatives in collaboration with other public, private and not-for-profit organizations, the Commission will consider proposals that promote and strengthen Salt Spring Island's economy in alignment with the CEDC objectives. CEDC support for individual projects will generally be less than $2,000, but in exceptional cases could be up to $5,000. Please refer to CEDC Community Development Program for program requirements and evaluation criteria. Cranbrook, the largest city in the BC Interior, is currently searching for resources for a Social Planning Society. Founded in 2008, their current priority is finding dedicated space for staff. Vision of Cranbrook: An inclusive, collaborative, connected and empowered community. The mission of the social planning council is to improve the living circumstances of individuals and community through social planning activities, coordinated research, collaborative engagement, and strategic action. "Few, if any, social issues are uniquely social and/or simple enough to be addressed by one or two agencies or individuals. Therefore, building relationships across sectors is a critical component of successful planning and action...The more you engage the community, the more they will engage you." Etherington, C. "Social Planning Needs Assessment", 2011. 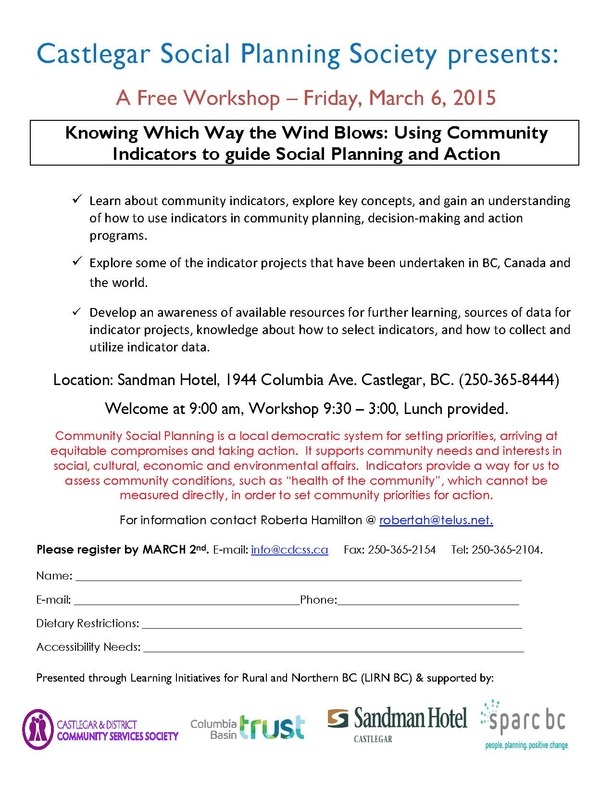 Castlegar has had a Social Planning Council for a number of years. It is coordinated by a member with limited on-going external support. Community Social Planning is a local democratic system for setting priorities, arriving at equitable compromises and taking action. It supports community needs and interests in social, cultural, economic and environmental affairs. Indicators provide a way for us to assess community conditions, such as “health of the community”, which cannot be measured directly, in order to set community priorities for action. The Jasper Community Team is now stronger than ever. Twenty organizations meet regularly and developmental stage outreach workers for children, youth and seniors ensure proper service delivery and program alignment. Kathleen Waxer, Director, who was instrumental in it's creation, is still driving it forward in 2015. More information on the Jasper Community Team model can be found on jaspercommunityteam.ca. COMMUNITY DEVELOPMENT COORDINATOR - FUNDING (Permanent, Full-time) Parkland County has a Permanent, Full-time position available for a Community Development Coordinator- Funding. This is a challenging and unique leadership and community development opportunity in the areas of recreation, culture and social based programs and services. Under the direction of the Supervisor, Parks, Recreation & Culture Services, your primary focus will be identifying and supporting the application and reporting of internal and external funding opportunities. In addition, duties will include Community Association support, Service Area support and other portfolios selected in collaboration with team members recognizing interests, strengths and Parks, Recreation & Cultures’ annual goals and strategic plan. "Smart Planning for Communities program helps communities of all sizes integrate social, cultural, economic and environmental considerations into planning processes. With Fraser Basin Council staff located across the province, we understand urban, suburban and rural issues and the planning needs of small and mid-sized communities." Supported communities include Kaslo, 100 Mile House, Clinton, and Granisle. While the Columbia Basin Trust does not have the same program, it is likely that CBT would provide some support if local government asked. "The Community Works Fund (CWF) is delivered to all local governments in British Columbia through a direct annual allocation to support local priorities. Local governments will need to enter into a 2014 CWF Agreement with UBCM prior to receiving funding. CWF is based on a per capita formula with a funding floor, and delivered twice annually. Local governments make local choices about which eligible projects to fund and report annually on these projects and their outcomes. The CWF program will deliver an estimated $519 million over the first five years to local governments." "The SPF is an application based program available to local governments and other recipients outside of the Greater Vancouver Regional District to support infrastructure and capacity building projects that are either larger in scale, regional in impact or innovative, and align with the program objectives of productivity and economic growth, a clean environment and strong cities and communities. The SPF program has two funding streams: capital infrastructure and capacity building. Under the Renewed Gas Tax Agreement, eligible project categories have been expanded to the following: public transit; local roads and bridges; community energy systems; drinking water; wastewater; solid waste; disaster mitigation; recreational infrastructure; cultural infrastructure; tourism infrastructure; sport infrastructure; local and regional airports; short-line rail; short-sea shipping; broadband connectivity; highways; brownfield redevelopment; and capacity building." Contact Ryan Watmough at nonprofits.gcrs@gmail.com. A Golden Community Resources Society initiative.